Professor Costas Th. Grammenos is Chairman of the Costas Grammenos Centre for Shipping, Trade and Finance, Cass Business School, City, University of London; Lloyd’s Register Foundation (LRF) Chair in Shipping, Trade & Finance; and Founding President of the Governing Body of the International Hellenic University, Greece. He joined City, University of London in 1982 as Visiting Professor and became Professor of Shipping, Trade and Finance in 1986. He was Pro Vice-Chancellor, City University of London from 1998-2011, Acting Dean, Cass Business School in 2000; Deputy Dean 2001; and Deputy Dean (Undergraduate) City, University of London from 2002-2010. 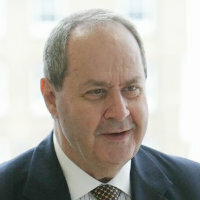 He was the Founding Director of the Cass Centre for Shipping, Trade and Finance in 1983 and became its Chairman in 2012. The Centre was renamed by City, University of London, the Costas Grammenos Centre for Shipping, Trade and Finance in April 2007. He was responsible for the inception, creation and design of the Centre; and, until 2003, was Director of the world class MSc Shipping, Trade and Finance, introduced in 1984. The Centre introduced the MSc Trade, Transport and Finance in September 1997 (from 2008-2012 known as MSc Supply Chain, Trade and Finance); and the MSc Energy, Trade and Finance in 2003. More than 3700 students, from over 150 countries, have graduated over this period, many of them are holding leading positions in international banking, shipping, and manufacturing sectors. In addition, the Centre has gained international recognition for its applied research in the areas of shipping finance, shipping and financial risk management, commodity trade, energy and finance, and is a major platform for international dialogue between senior business executives, government and academia. Within this framework the Centre organizes the City of London Biennial Meetings (1999-date); the Athens Triennial Meetings (2004-date); and the Onassis Prizes, internationally significant awards for leading academics in Shipping; in International Trade; and in Finance (2008-date). He began his career in the National Bank of Greece in 1962, and was financial shipping expert at the Bank’s head office in Athens, from 1973-1974. He was Independent Researcher and Advisor from 1977 until 1982. He joined City, University of London in 1982 as Visiting Professor and became Professor of Shipping, Trade and Finance in 1986. He teaches Shipping Investment and Finance where, in 1977, he had introduced credit analysis and policy of bank shipping finance which, since then, has been applied by most international banks. He introduced, through the MSc, a new approach in international business, “the spherical approach”. He wrote the well-known seminal monograph on the subject ‘Bank Finance for Ship Purchase’ (1979) University of Wales Press, and overall has written papers and studies published in refereed academic journals and specialist trade publications. Since the mid 1980’s, through his research, class teaching and public presentations, he would draw the attention of the shipping world to the potential of public and private equity and debt markets as new sources for shipping finance. He is the Editor of the major academic publication ‘The Handbook of Maritime Economics and Business’ (2002, 20010), LLP, where 50 leading academics from 30 universities in 19 countries contributed 39 chapters. He has given papers and lectures in various parts of the world. He was 1998 Seatrade Personality of the Year; in 2008 he was awarded the prize of Distinguished Personality for his outstanding contribution to the shipping industry by the Association of Banking and Financial Executives of Hellenic Shipping; in 2008 was awarded the ‘Achievement in Education or Training’ at the Lloyd’s List Greek Shipping Awards; and in 2017 was presented with the Capital Link Greek Shipping Leadership Award. He is Member of the Board of Directors of the Alexander S. Onassis Public Benefit Foundation (1995-date), Member of the American Bureau of Shipping (1996-date), FRSA (1996-date), Founder and Chairman of the City of London Biennial Meetings (1999-date), Chairman, Athens Triennial Meetings (2004-date); Non-executive Member of the Board, Marfin Investment Group (MIG) (2007-2010), Freeman of the City of London (2000), Liveryman of the Worshipful Company of Shipwrights (2002), Fellow of the Chartered Institute of Bankers (2004). He is Visiting Professor at the University of Antwerp (2000-date) and was President of the International Association of Maritime Economists (IAME) (1998-2003); Honorary Fellow, Institute of Marine Engineers, Science and Technology (IMarEST) (2008); First Deputy Chairman, Maria Tsakos Foundation, Greece (2014-date). He is Founding President of the Governing Body of the International Hellenic University, Greece (2006-date). Appointed CBE (Hon) for 'services to teaching and research'. English and Greek, Modern (1453-). Grammenos, C.T. (2010). The Handbook of Maritime Economics & Business. Informa Law from Routledge. ISBN 978-1-84311-880-0. Grammenos, C.T.H., Dergiades, T., Mazis, G., Meersman, H., Van de Voorde, E. and Vanelslander, T. (2014). Evidence on the pricing of the syndicated loans for the global port industry. Port Infrastructure Finance (pp. 87–110). Taylor and Francis. ISBN 978-1-315-77583-8. Grammenos, C.T. (2010). Revisiting credit risk, analysis and policy in bank shipping finance. In Grammenos, C.T. (Ed. ), The Handbook of Maritime Economics and Business Informa Law from Routledge. ISBN 978-1-84311-880-0. Grammenos, C.T. (2009). Development & Issues in Shipping Finance. In Meersman, H., Van de Voorde, E. and Vaulslander, T. (Eds. ), Future Challenge to the Port & Shipping Sector (pp. 127–141). London: Informa. Grammenos, C.T. (2002). Credit Risk Analysis and Policy in Bank Shipping Finance. In Grammenos, C.T. (Ed. ), The Handbook of Maritime Economics and Business (pp. 731–761). London: Lloyd's List Informa. ISBN 978-1-84311-195-5. Grammenos, C.T. and Marcoulis, S.N. (1996). Shipping Initial Public Offerings: A Cross Country Analysis. In Levis, M. (Ed. ), Advances in Finance, Investment and Banking, 2: Empirical Issues in Raising Equity Capital (pp. 379–400). Elsevier - North Holland. Grammenos, C.T. (2011). Evolutions in Shipping Markets. Experts Meeting: "Tackling Furture Port Challenges: the way forward" Antwerp. Grammenos, C.T. (2010). Global Shipping and Finance: From One Decade to the Next (Keynote Speech). Capital Link Greek Shipping Forum: Accessing Capital in Today's Market 23 February, Athens, Greece. DSc, C.B.E.G., Th, C. and Grammenos, C. (2009). Keynote Speech. PriceWaterhouseCoopers Shipping Conference London. Grammenos, C.T. (2007). Developments and issues in Shipping Finance. Experts Meeting, Antwerp University on Future Challenges for the Port and Shipping Sector. Grammenos, C.T. (2007). Public Lecture on Post Second World War Issues and Developments in Shipping Finance. Hong Kong Shipowners' Association HongKong. Grammenos, and Th, C. (2007). The Maritime Cluster of Piraeus, London & Oslo. Athens Biennial Meeting Athens. Grammenos, C.T. (2005). Shipping Finance in the 21st Century. Keynote Speech: BIMCO Centenary General Meeting Copenhagen. Grammenos, C.T. (2004). Banks and Capital Markets in Shipping Finance:Challenges and Prospects. Keynote Speech. International Association of Maritime Economists Ismir Conference. Grammenos, , Th, C., Alizadeh, , A, , Papapostolou, and C, N. (2004). Factors Affecting the Yield Spreads in the Shipping High Yield Bond Market. International Association of Maritime Economists Ismir Conference Co-authors: Grammenos, C. Th., Alizadeh, A., Papapostolou, N.C..
Grammenos, C.T. (2003). Ship Finance: Challenges and Prospects. Keynote Speech. BIMCO Barcelona. Grammenos, C.T. (2002). Shipping Finance : A Changing World. Maritime World 2025 Conference : Future Challenges & Opportunities - University of Greenwich Greenwich, London. Grammenos, C. (2000). Capital Markets and Shipping Companies: Some Conclusions. Maritime Industry Conference Chamber of Shipping, Istanbul. Grammenos, C.T. (2000). Challenges and Prospects in Financing the International Shipping Industry. Public Lecture University of Strathclyde, Glasgow. Grammenos, C. (2000). Structural Changes and Possible Consequences for the Bulk Shipping and Shipping Finance Sectors. Public Lecture The Propellor Club, London. Grammenos, C. (1999). Challenges and Prospects in Shipping and the Shipping Finance Industry in the 21st Century. The first City of London Biennial Meeting, organised by City University, London London. Grammenos, C.T. (1999). Keynote speech for round table discussion on "World Shipping: Fat or Lean Times?" Centre for the Study of Financiaql Innovation, London. Grammenos, C. (1999). Shipping Finance in 2000 and Beyond. Public Lecture University of Newcastle. Grammenos, C. (1998). A Discussion of: 100 Problematic Loans as they stood in 1984; The Shipping Credit Policy of 10 International financial Institutions in the years 1979 and 1994. Intercargo Conference on Dry Bulk Shipping and its Future London. Grammenos, C. (1998). Raising Equity through Stock Exchanges: The Shipping Companies Case. The 12th Chua Chor Teck Annual Memorial Lecture Singapore. Grammenos, C. (1998). There is still a need for Credit Policy and Analysis in Bank Shipping Finance. Public Lecture Singapore Shipping Association, Singapore. Grammenos, C.T. (1984). The Role of an International Bank in the Current Depressed Shipping Market. Public Lecture Hellenic Society of Professional People and Scientists in Great Britain, London. Grammenos, C.T. (1981). New and Old Considerations in International Banking for Shipping Finance. Public Lecture Inaugural lecture, Shipping Club, Harvard Business School, Cambridge, USA. Grammenos, C.T. (1980). Transnationalisation of the Greek Commercial Banks. Public Lecture Public Lecture organised by the Alumini of Athens College, Athens. Grammenos, C.T. (1979). The Changing Pattern of the Greek Commercial Banking System. Public Lecture Public Lecture organised by the Institute of European Finance (Baltic Exchange), London. Grammenos, C.T. (1977). The Need for Credit Policy and Analysis in Bank Shipping Finance. Public Lecture Institute of European Finance, Bangor, N. Wales. Grammenos, C.T. and Arkoulis, A.G. (2003). Determinants of spreads on new high yield bonds of shipping companies. Transportation Research Part E: Logistics and Transportation Review, 39(6), pp. 459–471. doi:10.1016/S1366-5545(03)00054-1 . Grammenos, C.T.H. and Arkoulis, A.G. (2002). Macroeconomic Factors and International Shipping Stock Returns. International journal of maritime economics, 4(1), pp. 81–99. doi:10.1057/palgrave.ijme.9100033 . Grammenos, C.T.H. and Arkoulis, A. (1999). The Long Run Performance of Shipping Initial Public Offerings. International journal of maritime economics, 1(1), pp. 71–93. doi:10.1057/ijme.1999.6 . Grammenos, C.T. and Choi, C.J. (1999). The Greek Shipping Industry. International Studies of Management & Organization, 29(1), pp. 34–52. doi:10.1080/00208825.1999.11656756 . Grammenos, C.T.H. and Marcoulis, S.N. (1996). A cross-section analysis of stock returns: The case of shipping firms. Maritime Policy and Management, 23(1), pp. 67–80. doi:10.1080/03088839600000053 . Maritime Economics & Logistics, Member of Editorial Board, 1999 – 2008.
International Journal of Shipping Law, London, Member of Editorial Board, 1995 – 2000. Experts Meeting: "Tackling Furture Port Challenges: the way forward". (Conference) Antwerp (2011). Invited speaker. Sixth City of London Biennial Meeting. (Conference) London (2010). Chair and Organising Committee. Keynote Speaker: Capital Link's Greek Shipping Forum. (Conference) Greece (2010). Invited speaker. Paper: Accessing Capital inToday's Markets & Positioning for the Rebound. PriceWaterhouseCoopers Shipping Seminar. (Conference) London (2009). Chair. Multi-year Experts Meeting on Transport and Trade Facilitation Maritime Transport and the Climate Change Challenge (UNCTAD). (Conference) Geneva (2009). Chair. PriceWaterhouseCoopers Shipping Conference. (Conference) London (2009). Invited speaker. Fifth City of London Biennial Meeting. (Conference) London (2008). Chair and Organising Committee. Second Athens Biennial Symposium, The Eugenides Foundation. (Conference) Athens (2007). Organising Committee and Chair. Hong Kong Shipowners' Association. (Seminar) HongKong (2007). Invited speaker. Experts Meeting, Antwerp University on Future Challenges for the Port and Shipping Sector. (Conference) (2007). Invited speaker. Athens Biennial Meeting. (Conference) Athens (2007). Fourth City of London Biennial Meeting. (Conference) London (2005). Organising Committee and Chair. Keynote Speech: BIMCO Centenary General Meeting. (Conference) Copenhagen (2005). Co-authors: Grammenos, C. Th., Nomikos, N.K., Papapostolou, N.C.
First Athens Biennial Meeting, The Eugenides Foundation. (Conference) Athens (2004). Chair and Organising Committee. Second Energy Risk Symposium. (Conference) (2004). Chair and Organising Committee. Keynote Speech. International Association of Maritime Economists. (Conference) Ismir Conference (2004). Paper: Banks and Capital Markets in Shipping Finance:Challenges and Prospects. International Association of Maritime Economists. (Conference) Ismir Conference (2004). Co-authors: Alizadeh, A., Papapostolou, N.C.
Third City of London Biennial Meeting. (Conference) Cass (2003). Chair and Organising Committee. Alumni Symposium: Greece in the 21st Century - Going International. (Conference) Corfu, Athens (2003). Chair and Organising Committee. Keynote Speech. BIMCO. (Conference) Barcelona (2003). Safety in Shipping Symposium. (Conference) City University Main Site (2002). Chair and Organising Committee. Maritime World 2025 Conference : Future Challenges & Opportunities - University of Greenwich. (Conference) Greenwich, London (2002). Second City of London Biennial Meeting: Competition and Innovation within a Global Context. (Conference) Cass (2001). Chair and Organising Committee. Public Lecture. (Seminar) University of Strathclyde, Glasgow (2000). (Public lecture) The Propellor Club, London (2000). Maritime Industry Conference. (Conference) Chamber of Shipping, Istanbul (2000). First City of London Biennial Meeting: Before the Millenium, From the City of London. (Conference) Cass (1999). Chair and Organising Committee. Keynote speech for round table discussion on "World Shipping: Fat or Lean Times?" (Seminar) Centre for the Study of Financiaql Innovation, London (1999). The first City of London Biennial Meeting, organised by City University, London. London (1999). (Public lecture) University of Newcastle (1999). The 12th Chua Chor Teck Annual Memorial Lecture. Singapore (1998). (Public lecture) Singapore Shipping Association, Singapore (1998). Intercargo Conference on Dry Bulk Shipping and its Future. (Conference) London (1998). Symposium - Developments in Central Europe and The City of London. (Conference) City University Main Site (1990). Organising Committee and Chair. Public Lecture. (Seminar) Grammenos C. Th (1984). Public Lecture. (Seminar) Inaugural lecture, Shipping Club, Harvard Business School, Cambridge, USA (1981). Public Lecture. (Seminar) Public Lecture organised by the Alumini of Athens College, Athens (1980). Public Lecture. (Seminar) Public Lecture organised by the Institute of European Finance (Baltic Exchange), London (1979). Public Lecture. (Seminar) Institute of European Finance, Bangor, N. Wales (1977). Cass professor awarded national honour by Greek President. (2013) All about shipping. Record turnout at 7th City of London Biennial Meeting. (2013) All About Shipping. Onassis Prizes honour world leading academics. (2012) www.shippingherald.com (website). The Last Word É. (2011) Lloyds List. Another Doctor Tsakos. (2011) www.lloydslist.com (website). Shipping must be proactive on environment. (2010) Lloyds List. Unctad calls foe co-ordinated approach to trade growth. (2010) Lloyds List. Poetic tribute to Maria Tsakos. (2010) Lloyds List. Modest man's role creates a very grand prize. (2009) Lloyds List. Shipping academmic who helped to chart the Five Cs. (2009) Lloyds List. Last Word: High Flyers Wanted. (2009) Lloyds List. Financial high-flyer. (2009) www.lloydslist.com (website). In case you missed it. (2009) Lloyds List. Greeks bear gifts. (2009) www.ft.com (website). Eugene Fama wins inaugural Onassis Prize. (2008) www.moneyscience.com (website). Be prepared fro some irresponsibility. (2008) Daily Telegraph (newspaper). Move in the right circles. (2008) Marine Money. Boosting excellence. (2007) www.tmcnet.com (website). News from the schools, November 2007. (2007) www.economist.com (website). Comparative study to assess impact of IPOs. (2007) Calibre Macroworld. Business prize to be Nobel achievement. (2007) Daily Telegraph (newspaper). Smart money Onassis Prize. (2007) Lloyds List. Business prize to be Nobel achievement. (2007) www.telegraph.co.uk (website). 'Nobel' proze for shipping launched in London. (2007) Calibre Macroworld. Take the doorstep challenge. (2007) The Independent (newspaper). Cass shipping chair secured with £1.5m. (2007) www.ft.com (website). Cass Shipping Chair Secured with £1.5m. (2007) Financial Times (newspaper). Comparative study to asess impact of IPOs. (2007) Lloyds List.